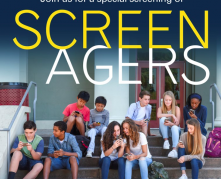 On Thursday, Jan. 17, Georgia Southern University College of Education (COE) will host a screening of “Screenagers: Growing Up in the Digital Age,” an award-winning film about the impact of technology on children’s development. The screening, which is free and open to the public, will begin at 6 p.m. in the Ogeechee Theatre, located in the Student Union on the Armstrong Campus. The documentary, featured in The New York Times, “Today,” “The Dr. Oz Show,” “Good Morning America,” “PBS NewsHour,” and CNN attempts to address how families can minimize the harmful effects of digital devices. Physician and filmmaker Delaney Ruston decided to make “Screenagers” when she found herself constantly struggling with her two kids about “screen time,” or the time spent looking at digital devices including but not limited to cell phones, tablets, computers and television. According to Ruston, children spend an average of 6.5 hours a day on screens, not including classroom or homework screen time. She also notes that some recent studies show that screen time increases dopamine production and causes behavior that mimics addiction. “While technology becomes more and more a part of our children’s lives, we have to have important conversations about issues such as: the impact of screen time on development; how to balance the use of technology at home and in the classroom; how to protect our kids from internet dangers; and how to educate kids about the potential perils of social media,” she said. Following the screening, the COE will host a question-and-answer session with expert panelists to discuss the movie’s themes. Panel members will include: Ruth Outz-Moore, Ph.D., National Certified Counselor; Lucas Jensen, Ph.D., associate professor of instructional technology at Georgia Southern; and Wendy Marshall, instructional technology program manager for Savannah-Chatham County Public School System. This screening is the first in a series of five events that will take place on the Armstrong Campus during the spring 2019 semester. The series is being offered at no charge to students or the community as a result of a Campus Life Enrichment Committee grant written and received by Rahimi and fellow COE faculty members Kathleen Burke-Fabrikant, Ph.D. and David Owens, Ph.D. The additional screenings will include: “Bully” on Feb. 12; “The Cartel” on March 5; “The School in the Cloud” on March 27; and “Elementary Genocide” on April 16. For more information about the screening, follow the COE on Facebook.